— Flavor the inside of a bowl by rubbing it with garlic. Beat together the egg yolk and Dijon mustard. Slowly, incorporate olive oil. — The emulsion must thicken and detach from the sides of the bowl. Add lemon juice, Cayenne pepper and season to taste. Refrigerated. — Put the potatoes directly in room temperature olive oil and then start to cook on high heat. This technique will allow the potatoes to blanch and get a nice golden color afterward. Sprinkle with fleur de sel as soon as you remove the fries from the oil. 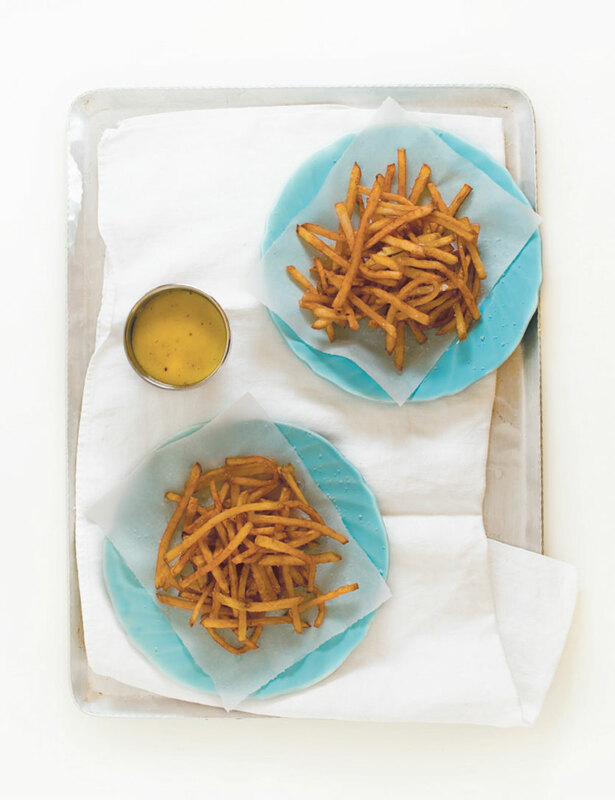 TRICK — French fries don’t like to wait… Therefore, they should be made at the last minute. NOTE — To make fries in extra virgin olive oil is not a sin, quite the opposite. It is simply divine. Since the potatoes are coated with olive oil, it is mandatory to use one of good quality. Thanks to the antioxidants present in extra virgin olive oil, it will remain stable even at a very high temperature, as high as 180 ˚C (350 ˚F). Olive oil is then ideal for frying and can be used 7 to 8 times as long as you filter it after each use. Store it in an airtight jar, in a cool place.